I admit, before last summer I had never cared much about bats. I didn’t think they were cute or of much use or interest, but then I met Rob Mies director of the Organization for Bat Conservation and his rehabilitated bats during an event at the Denver Museum of Nature and Science. I learned that bats make up a large part of the world’s ecosystem, in fact, a quarter of all mammal species are a type of bat! I learned that they are intelligent and affectionate creatures and actually kind of cute when you get past all the misconceptions about rabies and blood drinking. The truth is humans would have a really hard time of it if it weren’t for bats controlling the insect population, reseeding deforested land, and pollinating plants, many of which we eat. I also learned that bats are in trouble and as usual, it’s pretty much our fault. Like all animals in the world human encroachment, habitat destruction, pesticides, and climate change are affecting bats, but more than that scientist believe that we humans brought a plague down upon bats in the form of White-nose syndrome. White-nose syndrome is caused by a fungus (Pseudogymnoascus destruction) native to Europe and Asia. Bats there are largely unaffected by it, but here in America, the fungus grows on a bat’s wings and noses causing them to wake up during winter hibernation and either starve or freeze to death. The fungus is decimating colonies and killing by the thousands with no cure and no signs of slowing. Once White-nose syndrome hits a bat colony up to 70%-90% of the bats roosting there will die. In some cases, the kill rate has been 100%, and scientist now warns that entire species may go extinct as the fungus makes a slow march across the country from the east coast to the west. We don’t know everything about bats, but we do know they do not cross oceans, but people do. It is believed that humans brought back this fungus from Europe and introduced it to colonies here through cave exploration. Seven species are affected, three of which are now on the (including three on the federal endangered species list. Kill estimates are as high as Tens of millions of bats since 2006 when the fungus was first recognized here. The disease moves so fast and kills so efficiently that it’s considered the worst wildlife disease outbreak in North American history. So, why should you care? Remember a few years ago when we were all in a panic of bee colony collapse syndrome, well it turns out the bees are bouncing back, but they aren’t the only one’s who save farmers, corporations, consumers, and the U.S. government billions of dollars a year. Back in 2008, the Forest Service estimated that due to White-nose syndrome and the deaths of around a million bats, 2.4 million pounds of insects went uneaten and free to damage crops and spread disease. They also provide pollination and seed spreading service, for free. All we have to do is respect them and keep them safe. We had one job…. So, how can you help? First of all, stop going into caves. Just stop. Saving these creatures is more important than your need to explore. If you have to please do so with trained professionals and observe proper decontamination protocols when you leave. Respect caves and mines that are closed, they are for a reason. Take some time to learn what you can about your own local bat species types and habits, then spread the word. Consider setting up your own bat house. And finally, don’t let your government slash budgets for programs that study, protect, and benefit the environment. Bats, like most animals, need to be protected from us and it’s important that we allow the government to do what we can’t, keep us out of their habitats. We need local parks and protected caves that we can’t go trampling in or building on whenever we want to. Call your local representative and you leaders in Congress, or send a fax by text, and let them know that humans are awful and out of control and for that reason, we need our parks and our scientists to keep the world safe before there is no other life to protect anymore. If you like this post check out my weekly-ish newsletter for interesting reads + my own existential musings on life, love, and inevitable human suffering, or buy me a cup of coffee perhaps? This post was written for the 2017 Blogging A to Z Challenge. My theme isThe World is Really an Awful Place. You can read the rest of the posts under the AtoZ2017 tag. When it comes to talk about the effects of global warming a lot of focus has been on Antartica, which saw record low levels of ice this past year, but as winter in the Northern Hemisphere comes to an end all eyes are on the Arctic as the trend toward higher temperatures, low sea ice levels, and shockingly low levels of human panic and action continue. For a bit of background, when I talk about the Arctic I am talking about the sea of ice to the north of Canada and Russia. In the summer, every summer, the ice melts as the sun becomes a constant fixture in the sky, and every winter the ice freezes again. It’s all normal and all due to Earth’s orbit, tilt, and the natural warming and cooling the seasons bring. This winter the Arctic froze, and when scientists measured the ice at it’s largest extent, there was a whole lot missing. Average Arctic ice extent should be something like 6.04 million square miles, in March of 2017, when we take these kinds of measurements, we had 5.57 million square miles of ice. We are missing 471,000 square miles of ice! And this isn’t the first time we have been below average, and it is not going to be the last. Less ice might not like such a big deal, except that it is. Arctic sea ice melt contributes to further and faster warming, since our bright white ice cap will be gone, it won’t reflect the sun’s rays back into space ad instead the heat will be absorbed by the ocean. Sea levels will rise, of course, and that’s bad for anyone living along the coast which is a whole lot of American citizens. Ocean and air currents will change due to the ice being gone and the temperatures being warmer. This leads to more climate change on average and more unstable weather patterns day to day. And of course, in the end, it all boils down to more death and suffering for animals and mostly poor people who are already suffering, but it won’t end with them. We will all feel the ramifications of this. See that part on the right that’s clearly outside of the gray area average, that was the end of 2016, far outside even a regular bad year. See the little line on the left sitting below every other year back to 1978? That’s the beginning of 2017 continuing along on a catastrophic path toward sea level rise, ocean ecosystem disruption, and the first signs of the end times. See that line veering off to the right well outside the mean and below every other year as far back as 1981, that’s 2016. I haven’t seen a version with 2017 on it yet, but I would bet a lot of money that just like ice area measurements we are still trending down and still, no one is doing anything about it. Instead, we’re running around arguing about whether or not the problem is even real. This is not normal. None of this is normal! You may hear people talk about natural cycles but take a look at another graph. This one shows measurement of atmospheric CO2 found in drilled ice cores containing bubbles of air from thousands of years ago. See that big spike on the end, well outside of anything ever, that 1950 to now. It is us! We are doing this! Now, this is all pretty bad, but it actually gets even worse. So much worse. All hope of stopping these trends is gone. We have done too much damage. CO2 measurements will continue to rise, and the ice is going to go on melting, even if we stopped everything, all the cars, all the deforestation, all the burning, today. There is just no way, right now, that we can get the gasses we put into the atmosphere, and the ocean, back out. We are fucked. We are so fucked and so stupid. Scientists started warning us back in 60s that burning fossil fuels and putting greenhouse gases like CO2 and methane into the atmosphere were going to lead to a warmer Earth which would lead to collapsing ecosystems and unstable weather patterns but too many people wanted to keep on making money and fought long and hard, and are still fighting today, to keep you from panicking or changing the way you do things. So what can you do now? Hell, why do anything if we are already too far gone? Well, even thought the earth is going to warm and the climate is going to change, and many many people and animals are going to die, we can lessen the extent and the suffering if we start today. The EPA has a list of things you can do today, but ost of us have read it and have made the changes that we can, but what we really need to do now is get the people who are in charge to stop being so damn selfish and stupid and do something about it. We need to contact our leaders in Congress and let them know that we will not stand for their cowardice any longer. You can even fax them by text now! There is no excuse. Change needs to happen now if we want to have a future where humans can at least survive, and you need to ask yourself here and now, do you care? Be honest with yourself, do you want something to be done, or do you like it better when you pretend there is no consensus or science to back this up? Are you a part of the solution or part of the problem? This post was written for the 2017 Blogging A to Z Challenge. My theme is The World is Really an Awful Place. You can read the rest of the posts under the AtoZ2017 tag. Last week I overheard something at work that normally would have sent me into a ranting rage if it weren’t for my resolution to mind my own business and stop being such a know-it-all all the time. He thought he was very clever with that one. He let his comment hang in the air as if he alone had settled the long debate over climate change right then and there. After an awkward pause, one man spoke up a little. He replied that, actually, the weather reports weren’t so different from one another—I mean, it isn’t like you see 70 degrees forecast on one channel and 20 degrees on another—and that the models for climate change were, in fact, pretty accurate. The first man didn’t reply though, and no one else spoke up, but I could tell his question had had the intended effect on a few of them. I chose not to speak up myself because, for one, I didn’t know this man, and two I knew that I would expend a lot of energy and get nowhere anyway. I’ll admit I was angry too. I was angry because these kinds of fake debate points are tiring and because, in my mind, he had committed a sin by seeking confirmation and followers in his willful ignorance! But more than that it made me sad. This man missed an opportunity he had presented to himself to learn something new. He must have known there is an answer to such a question. He could have taken it his phone, fired up Google, and learned something that day, but he was too arrogant to consider that he didn’t know something. He stated his question as the answer—the end of the inquiry and not the beginning—and learned nothing. Humans like to know things. We like it when other people think we know things too. We enjoy the respect knowledge commands, and we feel useful when our knowledge is relied upon. So, we go about pretending we know everything. We form opinions and tell ourselves they are the same as facts. Our perspective, our mindset, our upbringing, and our way of life are real and right, and all the rest is wrong. Case closed, discussion over. The reality is scary. The reality is we don’t know much of anything. We are floating on an open sea with no land and no sign telling us how to survive or which way to swim. We cling to anything that feels solid, anything that feels like a fact because it is better to float on a lie than to risk drowning in the search for truth. It doesn’t help that social media, advertisements, and ratings are killing our ability to investigate, deliver, and believe in facts. Now we are divided between believing everything and believing nothing and while we fight we are dying and so is the planet. We are coming to a time when our survival will depend on our bravery in the face of our ignorance. It will be hard, but it starts with just a small step. It starts with you. It starts with seeing that you don’t know much for sure but that you can find the knowledge you need every day if you try. You have to get comfortable with your ignorance. Tell yourself it’s ok not to be 100% sure. It’s okay not to have all the answers. At work, as a parent, in your relationship and in the face of your future but what isn’t okay is to give up on curiosity and genuine knowledge. Science and human advancement are collective endeavors. It takes all of us, working together to move them. It takes the scientists who have a passion for truth and develop everyday new ad better ways to find it. It takes politicians who care about the future of all people to create policies that prioritize advancement and discovery over profits. It takes a voting body of people who elect officials who are honest and who demand and consume media that is fact based. It takes all of us to move further into a better understanding of our reality and what we ought to be doing or going. But how do we know what is right and wrong? How do we know who to trust? These are questions that bigger and better minds than mine are tackling right now, but I am learning that it does take a leap of faith, a hard thing for a nonreligious person like myself to accept. The best I can tell you is to look for consensus in the scientific community, in the intelligence community, and in responsible news reporting agencies. This is the best we have, but we are weakening it by ignoring it, dismissing it, and refusing to take it seriously and make it an important part of our culture and daily lives. Don’t read just one story. Don’t read stories from unknown and unverified media sources. Don’t just read the headlines and don’t share stories without reading. Ask questions and then look for answers. Look for answers in more than one place. Look for videos and articles about how to think logically and check out a few Crash Course videos on the basics of science and philosophy. It’s just a start, but it’s the start of something very big, a way of life where curiosity, logic, and knowledge are a priority. This week, be curious, and do it with intention. Choose to learn something new or dig a little deeper into a story you saw fly across your timeline. Don’t let your own mind grow stagnant. Don’t just accept your own way of thinking and your own knowledge. Do not let yourself think you already know anything or that you cannot keep learning every day. Do not forget how far human curiosity and refusal to give up or give in has gotten us. We are far from the end of what we can know. Get out there, and get swimming through your own ignorance. Then teach something, and then help those around you do the same. We only get better, we only do better, when we learn better, and that starts with each of us. Check out my weekly-ish newsletter for interesting reads + some of my own existential musings on life, love, and inevitable human suffering, or help support what I do by sharing a cup of coffee. Looking for some interesting reads to check out while you kick back and relax? I’ve got you covered! Every weekend I like to share with you the most interesting things I found across the great, wide web. This week I’ve got a psychotic novel generator, science and more science, octopuses, and some beautiful poetry. Enjoy! Now, the online application Psychotic Writer allows you to generate your own personal Jack Torrance looney-tunes novel. Press the button and off it goes! I cannot tell you how amused I was was with this. I am a huge fan of The Shining (both the movie and the book) and to be able to print page after page of “All work and no play make Jack a dull boy.” is so f-in awesome. In the image, we can see the “heart” of Pluto in much greater detail than before, craters that were impossible to make out in previous images, and a great view of the dwarf planet’s dark equatorial belt. I have a soft spot for Pluto, or as I call it “the little demoted dwarf-planet that could”. I was so happy that this past week was all about the little guy and I was geeked to see the amazing images NASA released. 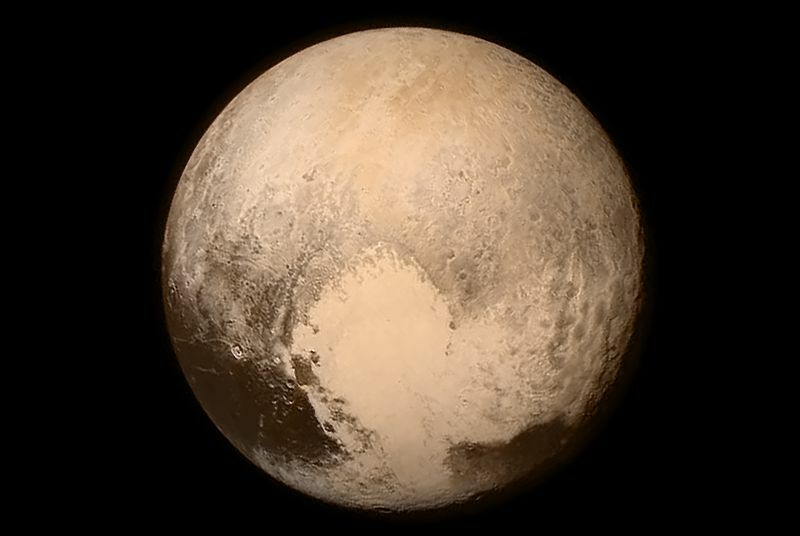 I’m sure you’ve seen the one of Pluto’s heart but here it is again anyway. Like the Higgs boson before it, the pentaquark’s existence has been theorized for years, but experiments in the early-2000s claiming to have detected the exotic form of matter were later invalidated. Many scientists had since given up on the pentaquark for good, but this time, say CERN physicists, there’s no doubt it’s been found. And as if visiting Pluto for the first time wasn’t cool enough we humans also found a brand new particle! Damn we are awesome! 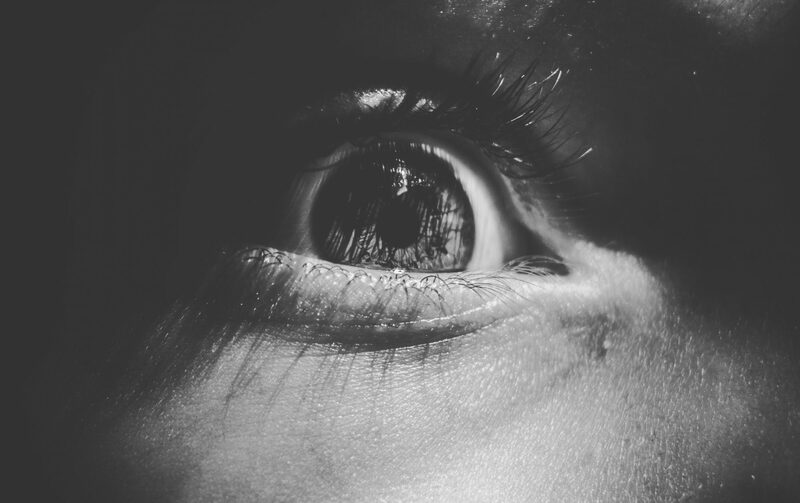 Many times I have stood mesmerized by an aquarium tank, wondering, as I stared into the horizontal pupils of an octopus’s large, prominent eyes, if she was staring back at me — and if so, what was she thinking? Anything about octopuses (yes, that is the correct plural) is bound to attract my eye, they are, by far, my favorite animals. Most people do not understand. They find them creepy and probably stupid but most people would be wrong. They are incredibly interesting and prove that there is more than one way to be an intelligent being. Maria Popova (one of my blogging heroes) wrote a post about the amazing poet Nikki Giovanni, then posted her own readings of a few of her favorite Giovanni poems. My favorite is “Choices”. If you have been following along on my little A to Z Astronomy posts you might have noticed the occasional mention of Pluto and my conflicting feelings on the demotion of Pluto from “planet” to “dwarf planet”. I thought that since this tiny little ball of rock and ice, lonely out there orbiting so far from the sun, held such an important place in my heart, it deserved a post all its own. Pluto officially discovered in 1930 but it’s existence was predicted earlier. It all started when a man named Urbain Le Verrier was studying the orbit of Uranus. He predicted that there was some other planet out there messing with Uranus’ orbit, that planet turned out to be Neptune. Then when astronomers were studying Neptune’s orbit they found that there had to be something else messing with Uranus’ orbit too. In 1906 a man named Percival Lowell founded the Lowell Observatory and started a project to look for the mysterious “Planet X”. 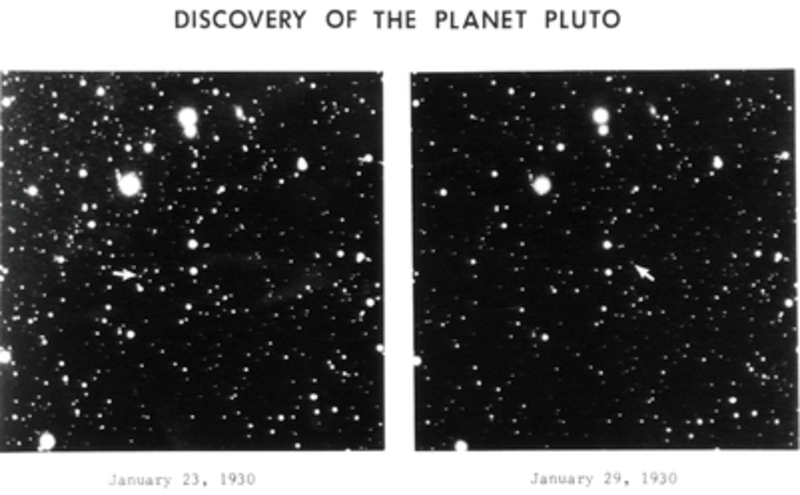 Lowell died in 1916 before the official discover of “Planet X” but before his death, and unknown to him, there had been two images captured of Pluto. Nobody recognized them for what they were though. Because of a legal battle with Percival’s widow regarding Lowell’s portion of the Observatory, the search for Planet X did not resume until 1929 where the job was handed off to Clyde Tombaugh. Tombaugh would take pictures of portions of the night sky in pairs and at different times. Then he would study the images to see if any of the celestial objects had moves. In 1930, after a year of looking at pairs of photographs Tombaugh found “Planet X” in a pair of images taken January 23rd and 29th of that year. The discovery was telegraphed to the Harvard College Observatory on March 13,1930. The discovery made headlines across the globe. Original plates from Clyde Tombaugh’s discovery of Pluto. (Apparent magnitude +15.1) Credit: Lowell Observatory Archives, from. The name Pluto came from the Greek god of the underworld and was suggested by an eleven-year-old girl named Venetia Burney (1918–2009). She suggested it to her grandfather Falconer Madan, a former librarian, who passed it on to astronomy professor Herbert Hall Turner, who then cabled it to colleagues in the United States. A vote was held at the Lowell Observatory, who had naming rights, and the name Pluto received every vote. The other options were Minerva and Cronus. I like the name Pluto but I might have voted for Minerva. In 1930 Walt Disney named Mickey Mouse’s companion Pluto, but it has never been confirmed that the name was inspired by the planet. In 1941, Glenn T. Seaborg named the newly created element plutonium after Pluto, in keeping with the tradition of naming elements after newly discovered planets, following uranium, and neptunium. Pluto orbits the sun about every 248 Earth years. Unlike the planets of the Solar System which have nearly circular orbits, Pluto’s orbit it highly eccentric and inclined, which means oval in shape and tilted. The eccentricity also brings it closer t the sun than Neptune for a portion of it’s orbit. Pluto has five known moons, the largest of which is Charon with a diameter just over half that of Pluto.Pluto and Charon are sometimes described as a binary system because the barycenter of their orbits does not lie within either body, or more simply, one does not seem to be entirely orbiting the other, they kinda orbit each other. The IAU doesn’t actually have a definition for binary dwarf planets though. The other moons are Nix, Hydra, Kerberos, and Styx. Currently there don’t seem to be many detailed images of Pluto’s surface. The above images were both taken by the Hubble telescope, the first (top) was taken in 1994, the second (bottom) is from 2002/2003.. As you can see the images aren’t sharp at all and we can’t exactly see any craters or mountains, but we can see that the terrain is varied. The white areas are frost and the dark areas are carbon-rich residue left over from the sun breaking up the methane in the surface. Due to it distance from Earth studying Pluto has been difficult but that is about to change. On July 14th of this year Pluto will be visited by the New Horizon’s Probe which will take more detailed measurements and images of the dwarf planet and it’s moons before heading off to visit the rest of the Kuiper belt. Speaking of the Kuiper belt, it was the discovery of this region beyond the planets, and Pluto’s place in it that prompted the demotion of Pluto from planet to “dwarf planet”. That and the 2005 discovery of another “trans-Neptunian object” named Eris, which was found to be approximately the same size as Pluto put the IAU in a pretty awkward position. Should they add Eris to the list of planets? Or create a new classification? It must have cleared the neighborhood around its orbit. It is the the 3rd criteria which sealed Pluto’s fate. Pluto’s orbit has many more objects then the planets of the Solar System, it just doesn’t have the mass to pull those objects in to eject them out with it’s gravity. After the definition for planet was finalized the new “dwarf planet” category was created for Pluto, Eris, and the other objects like them. While the decision makes sense there has been push back from both the public and other members of the astronomical community. One valid point was that only five percent of astronomers voted to demote Pluto, therefore the vote does not represent the views of the entire astronomical community. There has also been an emotional reaction from the public, myself included. I have mixed feelings about Pluto not being a planet anymore. On the one hand I grew up in the late 80s and early 90s and when I was in school I was taught that Pluto was a planet. Growing up I always felt bad for lonely little Pluto out there cold and alone. For me it’s demotion was just sad. On the other hand I am a “science person” which means when facts do not support something, I have to let it go. I agree that Pluto is not like the other planets, and I agree that it makes sense to reclassify it. But deep down I have this spot in my heart for little Pluto, and I imagine I always will. Image: Shining brightly in this Hubble image is our closest stellar neighbour: Proxima Centauri. Proxima Centauri lies in the constellation of Centaurus (The Centaur), just over four light-years from Earth. Although it looks bright through the eye of Hubble, as you might expect from the nearest star to the Solar System, Proxima Centauri is not visible to the naked eye. Its average luminosity is very low, and it is quite small compared to other stars, at only about an eighth of the mass of the Sun. However, on occasion, its brightness increases. Proxima is what is known as a “flare star”, meaning that convection processes within the star’s body make it prone to random and dramatic changes in brightness. The convection processes not only trigger brilliant bursts of starlight but, combined with other factors, mean that Proxima Centauri is in for a very long life. Astronomers predict that this star will remain middle-aged — or a “main sequence” star in astronomical terms — for another four trillion years, some 300 times the age of the current Universe. 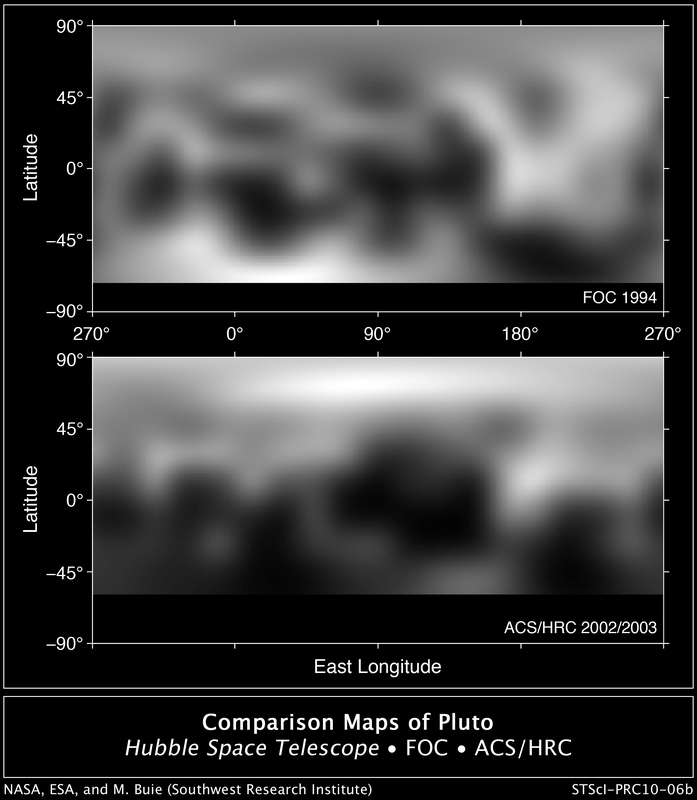 These observations were taken using Hubble’s Wide Field and Planetary Camera 2 (WFPC2). Proxima Centauri is actually part of a triple star system — its two companions, Alpha Centauri A and B, lie out of frame. Although by cosmic standards it is a close neighbour, Proxima Centauri remains a point-like object even using Hubble’s eagle-eyed vision, hinting at the vast scale of the Universe around us. Most people think that our Solar System ends out there with Pluto, the sad, demoted dwarf planet. Most people don’t really think about what lies between us and our nearest neighbor Proxima Centauri. We assume it’s all just empty space but we might be wrong, there could be a cloud of dust and icy planetesimals, the stuff planets are made of, called the Oort cloud. Sometimes called the Öpik–Oort cloud, it is named after Dutch astronomer Jan Oort, who made significant contributions to the understanding of the Milky Way, and Estonian astronomer Ernst Öpik, who postulated the theory that comets in our solar system originated in a cloud orbiting far beyond the orbit of Pluto in 1951. It is thought to orbit the sun from about 2 light-years out, which is about half the distance to the nearest star Proxima Centauri, and marks the outer boundary of our Solar System and the end of the Sun’s gravitational dominance. It’s hard to picture it but the Oort cloud, if it exists, is really, really far out there. Well beyond Pluto! The are two regions to the Oort cloud, the outer, spherical one, and a donut-shaped inner one. The outer one is barely held gravitational to the sun and may supply all of the longer term, Halley-type comets. The inner cloud is sometimes called the Hills cloud, named after Jack G. Hills, who proposed its existence in 1981. The outer Oort cloud may have trillions of objects, The inner cloud is thought to contain tens or hundreds times as many comets as the outer one. The vast majority of the objects are made of rock and ices such as water, methane, carbon monoxide, and hydrogen cyanide. So the Oort cloud is made mostly of comets, but how do they get from the Oort cloud into the obits of the planets so that we can see them. It is thought that there is a tidal force the Milky Way Galaxy exerts on the Oort cloud much like the moon works on the Earth’s oceans. The Milky Way exerts this effect on all objects in the Solar System but the Sun dominates. 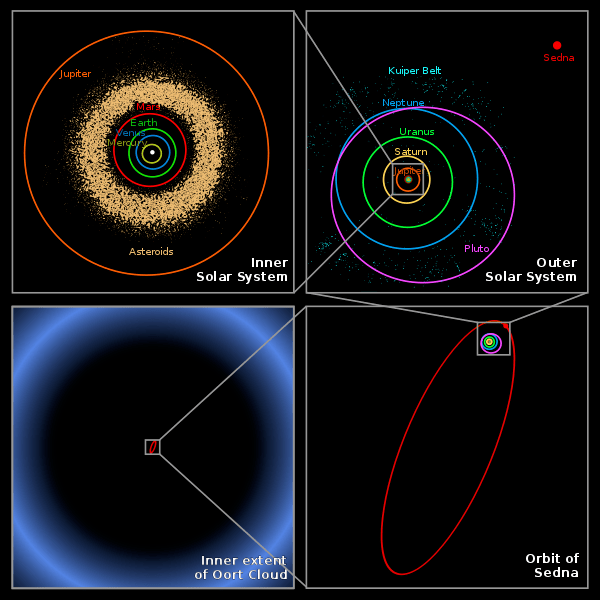 Far out in Oort cloud the Sun’s gravity is weak and the Milky Way’s can be felt more strongly. The Galaxy stretches and compresses the cloud and once an object gets a little closer to the inner Solar System the Sun’s gravity takes over and the object begins to free fall toward the inner planets and the sun. Once it goes around it has picked up a lot of speed and is shot back out to the outer Solar System where the process begins again. To me the Oort cloud is a sort of Wild West of our tiny corner of the universe. Hell, we aren’t even sure it exists! It’s amazing that there is an area so (relatively) close to home that we know almost nothing about. Nothing for sure anyway. Image: In one of the most detailed astronomical images ever produced, NASA/ESA’s Hubble Space Telescope captured an unprecedented look at the Orion Nebula. … This extensive study took 105 Hubble orbits to complete. All imaging instruments aboard the telescope were used simultaneously to study Orion. The Advanced Camera mosaic covers approximately the apparent angular size of the full moon. The Orion Nebula (also known as Messier 42, M42, or NGC 1976) is a diffuse nebula situated in the Milky Way south[b] of Orion’s Belt in the constellation of Orion. It is one of the brightest nebulae, and is visible to the naked eye in the night sky. M42 is located at a distance of 1,344 ± 20 light years and is the closest region of massive star formation to Earth. The M42 nebula is estimated to be 24 light years across. It has a mass of about 2000 times the mass of the Sun. Older texts frequently refer to the Orion Nebula as the Great Nebula in Orion or the Great Orion Nebula. Just about every one has heard of Sir Isaac Newton, the English physicist and mathematician, “natural philosopher”, and one of the great minds of the 17th century Scientific Revolution. He is widely regarded as one of the most influential scientists of all time and best known for his work in formulating the laws of motion and universal gravitation, which dominated scientists’ view of the physical universe for the next three centuries. Newton is also credited with removing the last doubts about the validity of the heliocentric model of the Solar System. He even helped invent calculus, simultaneously, yet separately, from Gottfried Leibniz. I can’t even understand calculus and this guy invented it! He did a whole lot more too and for the life of me I cannot understand where he found the time, energy, and pure genius to do so much in one short human life-span. He is one of my favorite scientists and no talk of astronomy would be complete without some mention of his name. Just about everyone has also heard of Newton’s laws of motion, which were derived from Johannes Kepler’s Laws of Planetary Motion and his own mathematical description of gravity as well. An object at rest will remain at rest unless acted on by an unbalanced force. An object in motion continues in motion with the same speed and in the same direction unless acted upon by an unbalanced force. A force causes a change in the velocity (acceleration) of an object (F=ma). Or, the greater the mass of the object, the greater the force required to accelerate it. 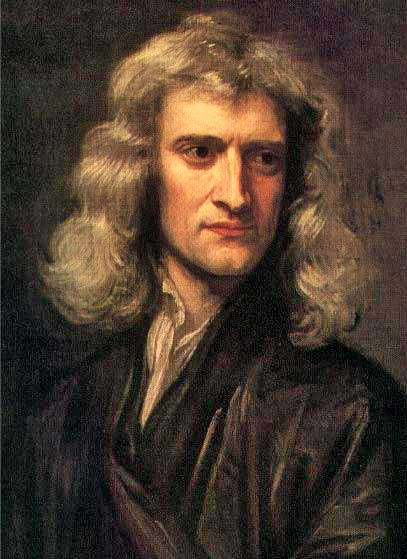 Newton, born Christmas day 1642, in county of Lincolnshire, England. He was born three months after his father’s deatch and he was premature. His mother said he was so small “he could have fit inside a quart mug”. At the age of three his mother went to live with her new husband and left him in the care of his grandmother. From his own accounts he hated his step-father and resented his mother for marrying him. In a list of sins committed up to the age of 19 he wrote: “Threatening my father and mother Smith to burn them and the house over them”. His step-father later died and Newton’s mother tried her best to turn him into a farmer but Newton hated farming. He went back to school and motivated partly by a desire for revenge against a schoolyard bully, he became the top-ranked student. In June 1661, he was admitted to Trinity College, Cambridge where he studied philosophy and astronomy. He was wasn’t a particularly remarkable student but was influenced by the philosophers Aristotle and Descartes, and the astronomers Galileo, Thomas Street, and Kepler and started writing a series of questions in his notebook pertaining to mechanical philosophy and developed a mathematical theory that would later become calculus. In August of 1665, the university had to close its doors against the Great Plague and Newton studied at home. This is where he really began to do his serious work. Over the next two years he developed his theory of calculus, optics, and gravitation. When he returned to Cambridge he was elected as a fellow of Trinity. Fellows were required to become ordained priests, but Newton managed to avoid it with a special permission from Charles II. 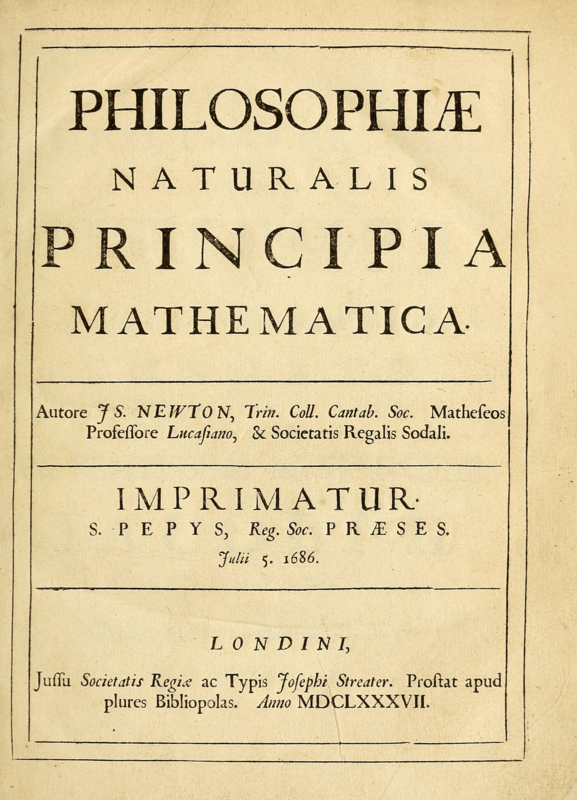 Newton’s most famous book, Philosophiæ Naturalis Principia Mathematica (“Mathematical Principles of Natural Philosophy”), first published in 1687, laid the foundations for classical mechanics, and is regarded as one of the most influential in the field of physics. In it Newton states that every point mass attracts every single other point mass by a force pointing along the line intersecting both point. According to his calculations, this force is proportional to the product of the two masses and inversely proportional to the square of the distance between them. Newton would go on to use these principles to account for the trajectories of comets, the tides, the procession of the equinoxes, and other astrophysical phenomena. His work also demonstrated that the motion of objects on Earth and of celestial bodies could be described by the same principles. I do not know what I may appear to the world, but to myself I seem to have been only like a boy playing on the sea-shore, and diverting myself in now and then finding a smoother pebble or a prettier shell than ordinary, whilst the great ocean of truth lay all undiscovered before me. He was a great but also flawed. It is said that he had a horrible temper and hated to hear any criticism of his work. He often feuded with other mathematicians, particularly with Leibniz over priority in the development of calculus. Newton was also deeply introverted and quite protective of his privacy. He is said to have been quite insecure. He suffered psychological problems and insomnia which culminated into a nervous breakdown in mid-1693, when, after five nights of sleeping ‘not a wink’, he temporarily lost all grip on reality and became paranoid of his colleagues. Despite all that though no one can deny his immense contribution to science and mathematics. In old age he was a famous man who had amassed a large collection of awards and wealth and his scientific discoveries were unchallenged. He never married or made many friends, what few he had worried about his mental stability. Around the age of 80 Newton began experiencing digestion problems. He was forced to drastically change his diet and mobility. Then, in March 1727, Newton experienced severe pain in his abdomen and blacked out. He would never regain consciousness. He died the next day, on March 31, 1727, at the age of 85. Image: This picture of Neptune was produced from the last whole planet images taken through the green and orange filters on the Voyager 2 narrow angle camera. The images were taken at a range of 4.4 million miles from the planet, 4 days and 20 hours before closest approach in August 1989. The picture shows the Great Dark Spot and its companion bright smudge; on the west limb the fast moving bright feature called Scooter and the little dark spot are visible. These clouds were seen to persist for as long as Voyager’s cameras could resolve them. North of these, a bright cloud band similar to the south polar streak may be seen. A magnetosphere is the area of space near an astronomical object, like a planet, that contains it’s magnetic environment. This is where object’s magnetic field dominates and charged particles are controlled. Near the surface of the object, the magnetic field lines resemble those of a magnetic dipole. As you get father away from the object it’s magnetic field lines are greatly distorted by electric currents. To give you an example, think of it as if the Earth is a huge dipole (2-pole) magnet. 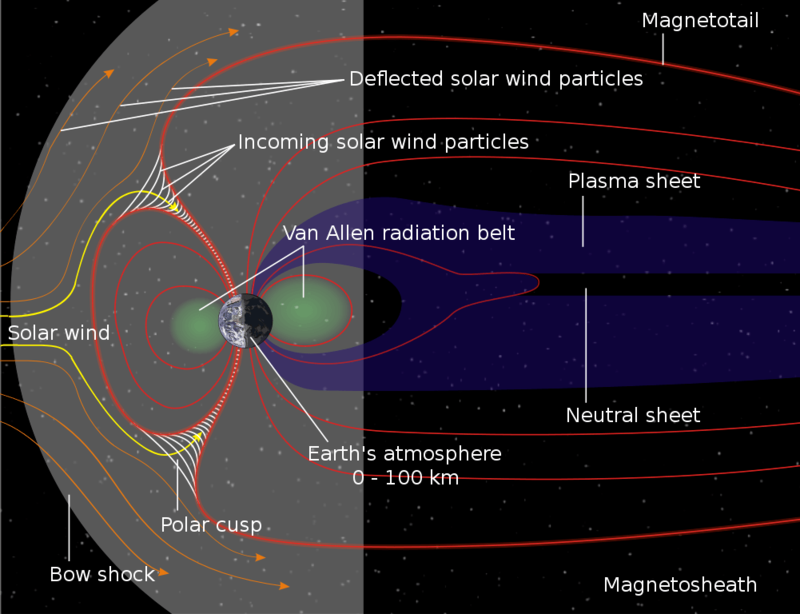 The magnetosphere extends several tens of thousands of kilometers into space and protects the Earth, and, by extension, us humans, from the charged particles of the solar wind, a stream of nasty plasma released from the upper atmosphere of the Sun. These winds and rays would strip away the upper atmosphere, including the ozone layer. The upper atmosphere is what protects us from harmful ultraviolet radiation. The magnetosphere also protects us from harmful cosmic rays, high-energy charged particles that are mostly from outside the Solar system. For the most part though the Sun’s own magnetosphere, called heliosphere, protects us from those. Sometimes the charged particles get inside the magnetosphere. They spiral around the field lines, bouncing back and forth between the poles several times per second. Some particles penetrate the ionosphere where the collide with the atoms there give rise to the aurorae, or northern lights. Our magnetic field is quite strong due to the motion of the molten iron is the Earth’s core and our quick rotation rate in a process that is actually pretty complex. The magnet field is roughly aligned with the north and south poles, which is why we can find our way with a compass, but Earth’s magnetic field likes to wander about. Right now it is tilted at an angle of about 10 degrees. 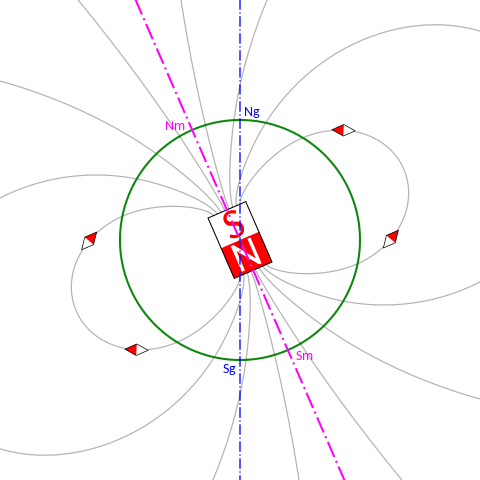 Every so often, about every several hundred thousand years or so, the magnetic field will actually reverse and the North and South Magnetic Poles will abruptly switch places. 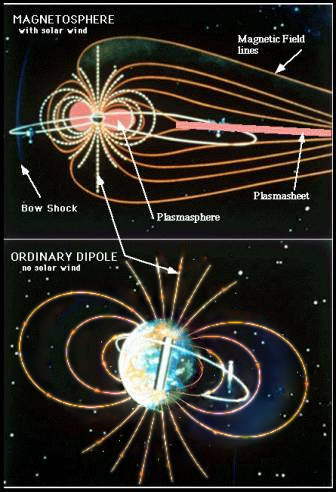 Despite the name the magnetosphere is not shaped like a sphere. On the side of the Earth facing the sun the magnetosphere is compressed and pushed closer to Earth’s surface by the push of the solar winds from the sun. When the solar winds hit this side the slow abrupty, that particular area is called the magnetopause, or the bow shock. On the night side the magnetosphere is stretched out and forms the magnetotail which extends far out into space. The magnetotail’s shape and length varies with the strength of the solar wind. The Sun’s magnetoshpere, also called the helioshphere, extends past all the planets and well into space. As mentioned before it protects our solar system from cosmic rays comic in from deep space. The sun’s magnetosphere is shaped much like our own and but the process that creates it is even more complex than the Earth’s. Because the sun is not a solid it’s rotation is more like that of a fluid and some latitudes moving faster than others. This causes it’s magnetic field lines to become “wound up” like a rubber band. Eventually these bands “snap” causing solar flares which impact our own magnetosphere. Jupiter also has a very large magnetosphere, the largest of all the other planets in the Solar System. It’s magnetotail extends almost all the was to Saturn on it’s night side. Magnetospheres are very important in astronomy and there is still a lot we don’t know about them. One thing we do know is that they are very important for the formation of life on a planet. The Earth’s own magnetosphere is a highly dynamic and life here on Earth developed and is sustained under the protection of it. If it weren’t for the magnetosphere we would be here at all. Image: Seen from the southern skies, the Large and Small Magellanic Clouds (the LMC and SMC, respectively) are bright patches in the sky. These two irregular dwarf galaxies, together with our Milky Way Galaxy, belong to the so-called Local Group of galaxies. Astronomers once thought that the two Magellanic Clouds orbited the Milky Way, but recent research suggests this is not the case, and that they are in fact on their first pass by the Milky Way. The LMC, lying at a distance of 160 000 light-years, and its neighbour the SMC, some 200 000 light-years away, are among the largest distant objects we can observe with the unaided eye. Both galaxies have notable bar features across their central discs, although the very strong tidal forces exerted by the Milky Way have distorted the galaxies considerably. The mutual gravitational pull of the three interacting galaxies has drawn out long streams of neutral hydrogen that interlink the three galaxies. Everyone has heard of a light-year, most of us from a science fiction book or movie, but very few understand exactly what it is and how it is used in astronomy. The inclusion of the word year often confuses people into thinking it is a measure of time but a light-year is actually a measure of distance. Think of it like when you are on your way to a friends house and you tell someone you are about “10 minutes away”, you substituted time for distance to give them a better idea of how far away you are. In order to make sure everyone is measuring distances in space the same way the light-year has been defined by the International Astronomical Union (IAU) as the distance that a beam of light travels in vacuum in one Julian year. Astronomers use the light-year mainly for convenience. The Julian Calendar moves slightly slower than the Gregorian Calendar we use everyday, 365.25 days as opposed to the 365.2425-day. We all know light can travel very, very fast, faster than anything we know, so light-years are often used to express great distances like those between stars or galaxies. It is especially used when writing or speaking in non-specialist or popular science circles. My guess is that it is very hard for us humans to imagine such large distances but when the distance is described in years it takes to get there at the fastest speed possible we get a better idea of the what is farther away than what. The unit usually used in professional astrometry, the branch of astronomy that involves precise measurements of the positions and movements of stars and other celestial bodies, is the parsec. A parsec is a measure of approximately 3.26 light-year. 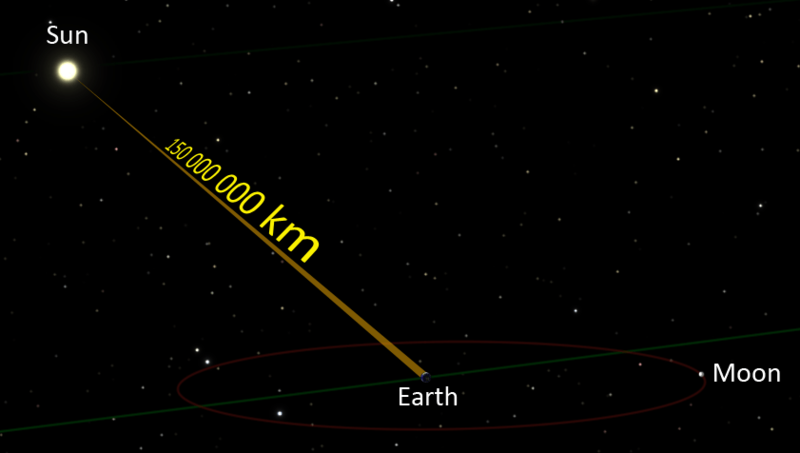 Traveling at the speed of light, you would encircle the globe of Earth almost eight times in one second. Traveling at light speed it would take about a second-and-a-half to reach the moon. From here to the sun is about 8 light-minutes. This is also known as the astronomical unit (au). The nearest known star, Proxima Centauri, is a little over 4 light-years away. Our own Milky Way galaxy is about 100,000 light-years across. The center of it is about 26,000 light-years away from us. The Andromeda Galaxy is approximately 2.5 million light-years away. From the Earth to the edge of the visible universe is about 45.7 gigalight-years in any direction. First used a few years after the successful measurement of the distance to a star by Friedrich Bessel in 1838. The star was 61 Cygni. He did recognize that readers would enjoy, and probably better understand, a unit of time rather than distance, but he refrained from using the light-year as a unit. It’s possible he thought it would degrade the accuracy of his measurements. And anyway, the speed of light was not yet precisely known in 1838; its value changed in 1849 and again in 1862. It wasn’t even considered to be a fundamental constant of nature. The light-year unit did appear, however, in 1851 in a German popular astronomical article by Otto Ule. The paradox of a distance unit name ending on year was explained by Ule by comparing it to a hiking road hour (Wegstunde). A contemporary German popular astronomical book also noticed that light-year is an odd name. In 1868 an English journal labelled the light-year as a unit used by the Germans. Whether or not it is a good name, it is here to stay. The human mind has a very hard time imagining the immense distances between celestial objects, but it can understand taking so many years to get from one place to another. It has become quite a popular term and anyone wanting to have a better understanding of astronomy has to understand it. Image: In 1957, Laika, a stray dog from the streets of Moscow, became the first animal launched into orbit as an occupant of the Soviet spacecraft Sputnik 2, paving the way for human spaceflight. This photograph shows her in a flight harness. Laika died within hours from overheating, possibly caused by a failure of the central R-7 sustainer to separate from the payload. The true cause and time of her death were not made public until 2002; instead, it was widely reported that she died when her oxygen ran out on day six or, as the Soviet government initially claimed, she was euthanized prior to oxygen depletion. On April 11, 2008, Russian officials unveiled a monument to Laika. A small monument in her honour was built near the military research facility in Moscow which prepared Laika’s flight to space. It features a dog standing on top of a rocket. Born in Germany in 1571, Johannes Kepler was a very important mathematician and astronomer and who helped lead a scientific revolution in the 17th century. He is best known for his three laws of planetary motion which are based on his works Astronomia nova, Harmonices Mundi, and Epitome of Copernican Astronomy. These works laid the foundation for Isaac Newton’s work on gravitation. Kepler was quite a religious man and much of his theories had to do with God and astrology. In his time there was no distinction between astronomy and astrology and he believed God had created the world according to an intelligible plan that could be known or glimpsed through reason and the sciences”. In his time astronomy was quite separate from the field of physics but Kepler treated astronomy as if it were a part of physics and called his new astronomy “celestial physics”. 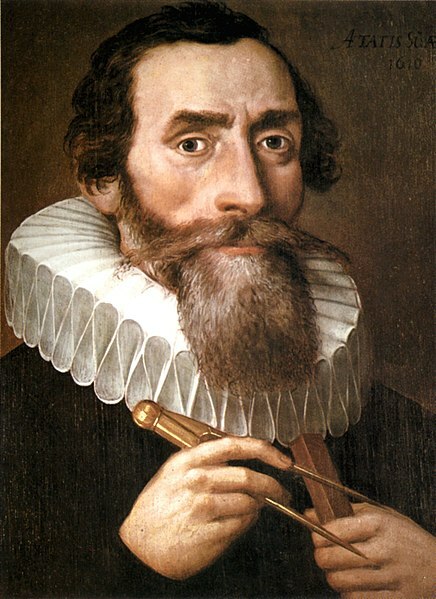 A 1610 portrait of Johannes Kepler by an unknown artist. Kepler fell in love with astronomy at a very young age and that love would span his entire life. When he was six-years-old his mother took him outside to see the “Great Comet of 1577” and when he was nine-years-old she called him out to witness a lunar eclipse and would recall the moon “appeared quite red”. A bout of childhood smallpox left him with poor vision and crippled hand that would limit his ability in the observational side of astronomy. Kepler was a believer in Copernicus’s heliocentric view of the solar system. To him it made obvious and logical sense that the Sun was at the center and the planets orbited around it. He said as much in his book Mysterium Cosmographicum (The Cosmographic Mystery), published at the age of 25. He noted that Mercury and Venus were always closer to the Sun, but if they all three orbited Earth then there should be no reason why Venus and Mercury were always closer to the Sun. His own belief was that the sun exerted some type of force on the planets orbiting it. He also believed that the solar system’s planets orbited the sun in circular paths whose sizes were determined by an arrangement of the five Platonic Solids. Remarkably, looked at in the way Kepler did, his Platonic solids theory produced a close fit to the planet-to-sun distances that Copernicus had found. He saw this as evidence of the hand of God in the the solar system’s design. Kepler also wrote one of the greatest books on astronomy ever written, Astronomia nova. It came after a ten-year-long investigation of the motion of Mars. He gave arguments for heliocentrism and provided insight into the motion of the planets, including the first mention of elliptical orbits. This was quite a big deal considering at the time the heavens were thought to be perfect and to suggest the planets moved in a a shape other than perfectly circular was revolutionary. Astronomia nova is recognized as one of the most important works of the Scientific Revolution. The orbit of every planet is an ellipse with the sun at one focus. A line joining a planet and the sun sweeps out equal areas during equal intervals of time. The square of the orbital period of a planet is directly proportional to the cube of the semi-major axis of its orbit. They may sound a bit confusing but stated very, very crudely they mean that the planets orbit in the shape of an oval and at one end they are closer to the Sun and move faster than the other end where they are further away and move slower. Despite the difference in speed they will cover the same area in the same amount of time in different part of the orbit. These are “Kepler’s Laws of Planetary Motion”. This may not seem very revolutionary but for Kepler’s time it was almost scandalous! In a 17 year period, he put astronomy on firm mathematical footing and influenced astronomer’s and physicists who would come later. Kepler died after falling ill at the age of 58, on November 15, 1630 in the German city of Regensburg and his grave is now lost. During his own lifetime, the huge significance of his work won little or no recognition but NASA honored Kepler by naming a mission after him. Launched on March 6 2009, the Kepler Mission involves a high-tech space telescope that will search for other Earth-like planets. Image: Detail of the Keyhole Nebula, imaged by Hubble Space Telescope. The small nebula to the upper left has been nicknamed “finger of God” or “God’s birdie“, due to the gesture it appears to be making.